Maybe you read an article that talked about Panda, Penguin and Pigeon updates, but don’t understand how these animals pertain to SEO? Well, we are here to help and offer advice on how to get started with Local SEO. Achieving high rankings and visibility in the SERPs (Search Engine Results Pages) for any business is the ultimate internet marketing goal, but it might not be the most achievable goal for your local company. The truth is that the conversions and sales lie in middle tail and long tail phrases because that traffic is more qualified. Your company might not be a national brand…yet, but it makes sense for you to start optimizing your local presence first before you take over the world. Where to start you ask? Here are a few areas to get you started. Does your Business Have Only One Name? Hopefully, you have selected one name for your business to which you want your customers to know you by. This one name should be what you select as the domain of your website. Your next step is to try and purchase this domain. It is ok if it isn’t a .com, just as long as it is close to matching the name of your business. Quick Tip: You only need one domain and one website, it is not necessary to try and purchase a several domains and set-up a bunch of websites, this is not SEO. So now you have a website, and of course, you want people to visit your website, but will they read your content, and will they convert? This is where creating your message comes in. Plan out what you have to say about yourself and your business and the features and benefits that make your company unique. Create pages of content that will be on your site, but don’t just tell your customers how great you are, tell them why you are great and the quality service you provide. As you can see, there are many different ways that a customer can search for your business, and there are probably many more. A good way to create a keyword list is to think of your main keyword and then think about 5 variations of that keyword. Take these 6 keywords and enter them one at a time into the Ubersuggest Keyword Tool. Google and Amazon’s predictive search features (Amazon for e-commerce) are also helpful for building keyword lists. Quick Tip: Using your city in your content and on your website (geotagging) is helpful for your customers to find your business and the locations you serve. However, you should not overuse your city in your content. 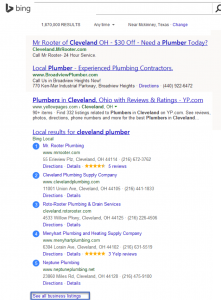 It might be scary, but the search engines are aware of the user’s location when they perform a query, so even if a user searches just “emergency plumber”, and they are performing this search from Cleveland, the search engines know that they are looking for emergency plumbers in Cleveland, Ohio. Click on the map results and it will take you to a Google Maps page. Enter your address into the search box. You will then see a local map, and the goal is to have a pin marker next to the name of your business and your business’ address. To accomplish this, your next step is to go here https://www.google.com/business/ and login (or create a Gmail account and login). Once you login, click on “Get Your Page” and it will ask you to choose a business type. If you are a plumber, you probably serve several cities around the Cleveland area, so you should select Service Area. It will ask you enter your business name or address. If you are not already listed, it will say “We could not find.” At that point, you will say that you have entered the name and address correctly, and you will be taken to a form to fill out the rest of the information about your business. Follow this process, and you will end up creating a Google My Business page for your company. There are ways that you can optimize your Google My Business page by adding pictures and detailed descriptions, but we can discuss this later. Google will now need to verify that you own this business by either calling you or mailing you a post card with a pin. Once you have entered this pin, your business listing is now live, and you can start receiving local search results. This is similar to the Google listings. You will then go to Bing Places where you can claim your listings or add a listing. You will click on “Get Started”, and then select your country and add your business phone number or business name. If your business does not show in the search results, you will select “Create new business.” You will have to create a Yahoo or Microsoft account now if you don’t already have one. Once you login you will fill out all the information about your business, it is important that fill out all as much information as possible and be as detailed as possible. NAP – This is your name, address and phone number of your business. It is important that you are consistent when you fill out this information about your business anywhere online. For your Bing listing, make sure and enter it exactly as you did for Google. It might even help to have all your business information in a Word Document or Google Doc so that you can just copy and paste, and you know your NAP will be consistent. After filling out all of your business information and going through the pin process again, your listing will be live on Bing. Now that you are live and on Google and Bing you have begun to establish your Local Search presence. It doesn’t matter if your business is large or small, it is always advantageous to invest in Local SEO. If you want to learn more about Local SEO and how your business can be optimized for Google and Bing, contact Advice Interactive at 877-692-7250.